In-country coordinators, field workers, and individuals in Bangladesh were interviewed about their role in the Data for Health initiative. Country Coordinators are the focal points that manage all Data for Health activities on the ground, field workers are often community health workers that have the responsibility to collect birth and death registration in addition to a plethora of other public health responsibilities in their organizations, and the citizens interviewed are those that have benefitted by receiving a birth or death certificate for a loved one through the Data for Health program. The individuals in Bangladesh who are helped by the government improvements supported by Data for Health include people from newborn babies who are receiving a birth certificate to family members of a deceased person who are obtaining a death certificate. 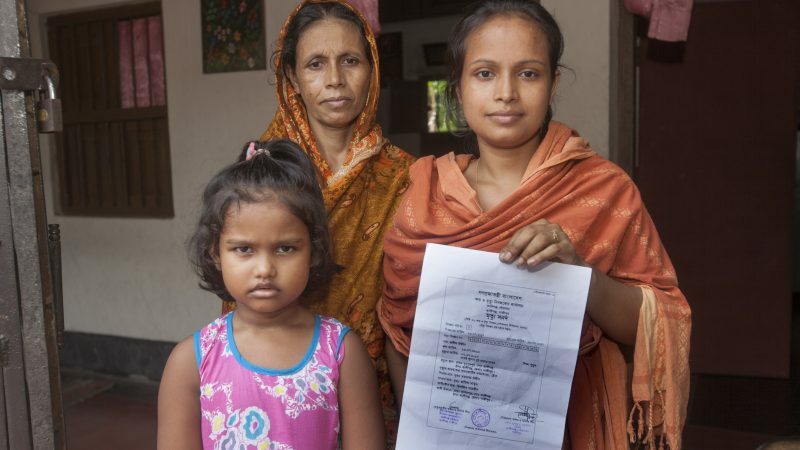 Jesmin Akter Nupur (right) holding the death certificate of her father alongside her mother and daughter. Jashim Uddin, a farmer in Bangladesh, died of an illness on July 7th, 2017. 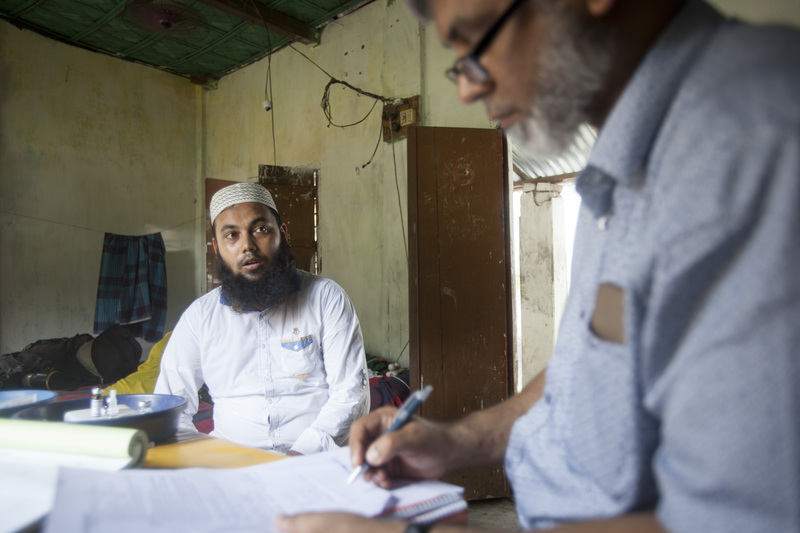 We spoke with his daughter, Jesmin Akter Nupur, from the village of Masurpiur in the district of Gazipur, Bangladesh, about the implications of obtaining a death certificate. The death certificate of her father is the only official memorandum she has of him. Without having this death certificate, Ms. Nupur would be stuck carrying the burden of a residual bank loan her father had. With the certificate in hand, she was able to get the loan exempted and will be able to settle the succession of property among her siblings. A field worker trained through the D4H initiative was able to support Jesmin in getting her father’s death certificate, assisting her in completing the registration application to get his death certificate. She was grateful to the government, registry office and health staff in getting the certificate “without delay or hassle.” The information, such as his name, address, date of birth and death, etc., are invaluable pieces of evidence for her to keep her father’s memory alive. Data for Health has helped improve the process of registering deaths by standardizing the registration process. Death certificates are not only critically important to families but also to policy makers. In understanding, how many people die and how they die, policymakers can craft evidence-based policies to improve population health. Similarly, a birth certificate is important on both population and personal levels. To mothers and fathers especially, it is critical to emphasize why birth certificates will carry a positive impact on their children’s lives. Runa Akter (left) holding her infant daughter’s official birth certificate with Country Coordinator, Jahangir Alam (right). Runa Akter, a mother of three daughters, from the Village of Munshefpur, is devoted to the betterment of life for her family members. “If I could ensure our daughters were educated properly and if I could see them happy in future, that would be my greatest achievement in life, nothing else”. Without registering the births of her daughters, they would not be able to gain access to an educational institution, could not get married officially, would not be able to have a passport, and would not have access to a multitude of private and public services. As mentioned, field workers have a lot of responsibilities including vaccinating children. It was during one of these vaccination visits, that a field worker helped Ms. Akter register her baby and receive a birth certificate. The strength of the Data for Health program relies on close partnerships with countries who are interested in improving health data. The Data for Health-supported Country Coordinators and other partners on the ground provide an essential bridge to ensure that the partnership best supports the improvements. Their comprehensive knowledge of and relationship to the government is crucial to the success of Data for Health. One Country Coordinator, Dr. Jahangir Alam, was once the private secretary to the Chairman of the Parliamentary Standing Committee. Like Dr. Alam, the other Country Coordinators, Dr. Moyeen Uddin and Dr. Shah Ali Akbar Ashrafi, have a background in the Bangladesh government. Another critical role in the Data for Health partnership is that of Field Workers. They handle the actual registration of births, deaths, and cause of death. Through Data for Health, they have undergone government-led training surrounding the importance of CRVS as well as how to register births and deaths in accordance with international and in-country standards. Field Workers differ from Country Coordinators in that they have full time positions as community health workers and birth and death registration is normally just one part of their job. Shahnaj Akhter, a field worker, meets with patients in the Kaliganj sub-district of the Gazipur district of Bangladesh. 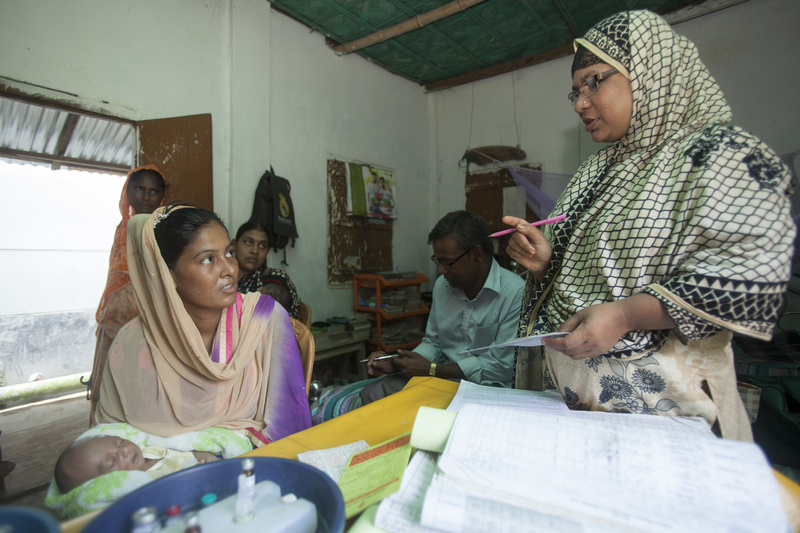 One field worker, Shahnaj Akhter, works in the Kaliganj sub-district of the Gazipur district of Bangladesh at a local health department as an Assistant Health Inspector. Outside of Data for Health, she works on multiple vaccine campaigns and initiatives. Through Data for Health, she supervises staff activities and ensures the quality of Verbal Autopsies (VA), which are a tool used to collect information on deaths that occur outside of a health facility. In order to help support the improvement of CRVS, Ms. Akhter is diligent about locating and speaking to pregnant women about the importance of registering their child’s birth. She often will trace these newborn babies and collect their parent’s national identification numbers in order to register their birth. Abdur Rahman (left) answering interview questions from Country Coordinator, Dr. Shah Ali Akbar Ashrafi (right). Abdur Rahman—a Field Worker and Health Assistant of Kaliganj Upazila in the Gazipur district of Bangladesh—works primarily to conduct disease surveillance, collect birth and death data, and implement government public health programs at the field level. Sustainability is one of the most critical aspects of engaging with communities worldwide. It is especially relevant to an initiative such as Data for Health that has such a widespread impact on the functionality of a government system. The Country Coordinators all indicated that “recurrent training sessions, institutionalization of Data for Health, and technical support for scaling-up the activities of Data for Health country-wide, phase by phase, including VA and MCCoD”, are all imperative in ensuring that improvements in birth and death data are sustainable. Data-driven solutions are a touchstone across Bloomberg Philanthropies, and it is important to share the stories of those who are actively working to improve data and the personal stories of those who are directly benefitting. Registering births and deaths both correctly and consistently allows doctors and health officials to determine the demographic pattern of diseases, in order to make a proper plan for resource mobilization. When data is up-to-date, widespread, and accurate, countries are able to craft better policies that reflect the needs of citizens.